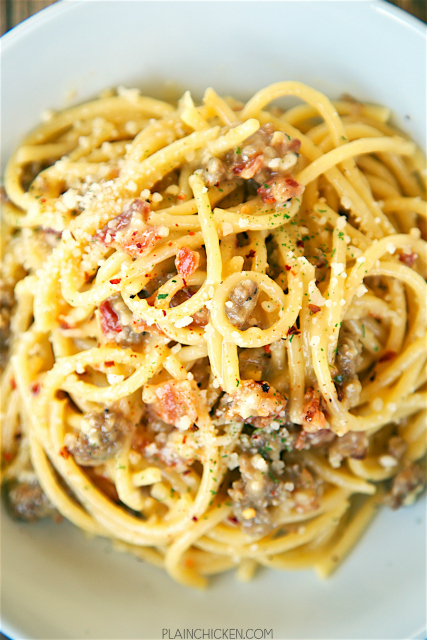 Bucatini Carbonara with Sausage - recipe from Buddy V's in Las Vegas. SO easy to make! Only takes about 10 minutes from start to finish! 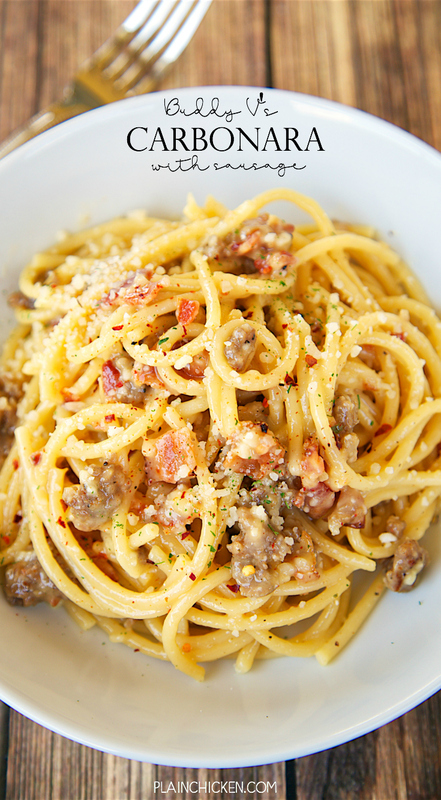 Bucatini, eggs, parmesan cheese, bacon, garlic, pepper and sausage. This was SO good that I wanted to lick the bowl! Easy enough for a weeknight. This recipe was inspired by our most recent trip to Vegas. We ate lunch at Buddy V's (The Cake Boss). We shared an order of meatballs and a bowl of carbonara. The meatballs were really good, but the carbonara was AMAZING! It was one of the best things we've ever eaten. We literally fought over the last few bites. I knew I had to recreate the pasta at home. I bought Buddy's cookbook while we were still sitting in the restaurant, and the recipe couldn't be any simpler. 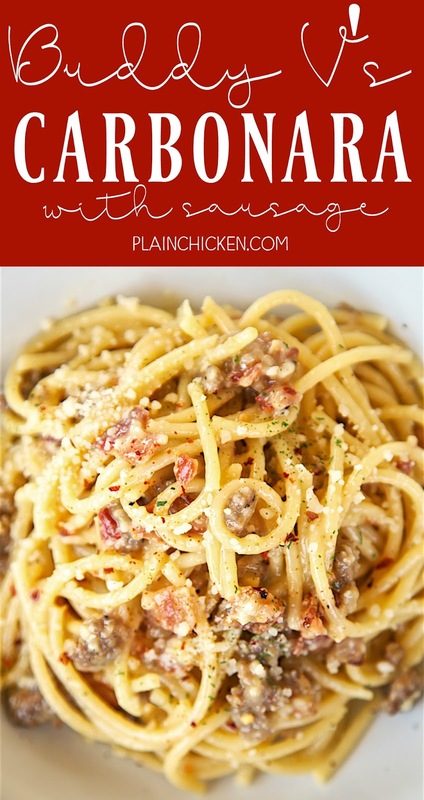 Pasta tossed with egg yolks, Parmesan, bacon, and garlic. We added some Italian sausage because that is how we ate it in the restaurant. This was just as incredible at home as it was in Vegas. The carbonara only took a few minutes to make - basically just the time it took to cook the pasta. LOVE!! Chicken Legs has already requested this again! I can't wait! In a large bowl, whisk eggs. Stir in cheese. In a skillet, cook bacon until crispy. Add garlic and cook for 30 seconds. Drain fat and chop bacon. In the same skillet cook the Italian sausage until no longer pink. Drain fat and set aside. Bring a large pot of salted water to a boil. Add pasta and cook until al dente. When pasta is done, reserve 1 cup of pasta water. Drain and put bucatini in bowl with the egg and cheese mixture. Toss thoroughly to coat. Add bacon, sausage and garlic. Toss to coat. If the pasta looks dry, add some reserved pasta water. Season pasta with pepper. Divide pasta among 4 bowls. Enjoy! Am I missing something, or is this eating raw eggs on pasta? And is it the whole egg or just the yokes? When you put the hot pasta in with the eggs, they morph into this creamy sauce. You should temper the eggs with a bit of the pasta water so they don't turn into scrambled eggs when you put the hot pasta in. Whisk in about 1/2 a cup of the starchy pasta water, then add the pasta, and toss to coat for a couple of minutes. It just sounds crazy, it's actually really delicious. Sorry, Whole egg. Some recipes call for an extra yoke as well. Just made carbonara last night...now I have to make it again! 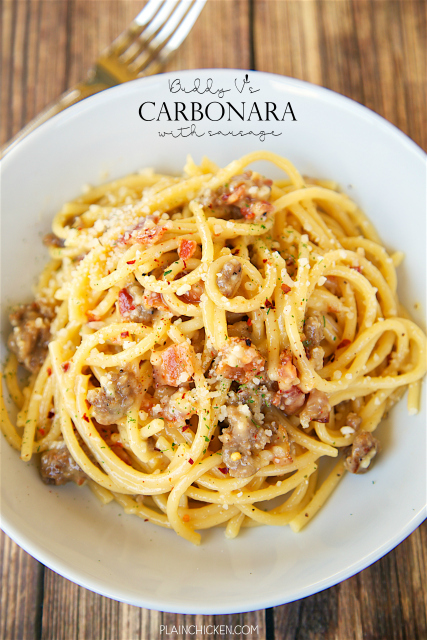 Spaghetti alla Carbonara - the ULTIMATE comfort food, I like the idea of adding Italian sausage and can't wait to try this!